Alas, I think the time has come to retire this blog. My posts were so infrequent, and there are many other places where you can find me where I actually update often. I will list a few of them here, and will update the list if I find myself frequenting some other future place often. I am keeping this blog up for posterity (I hoard all of my internet past!) but am unlikely to update it. Here’s one final image! 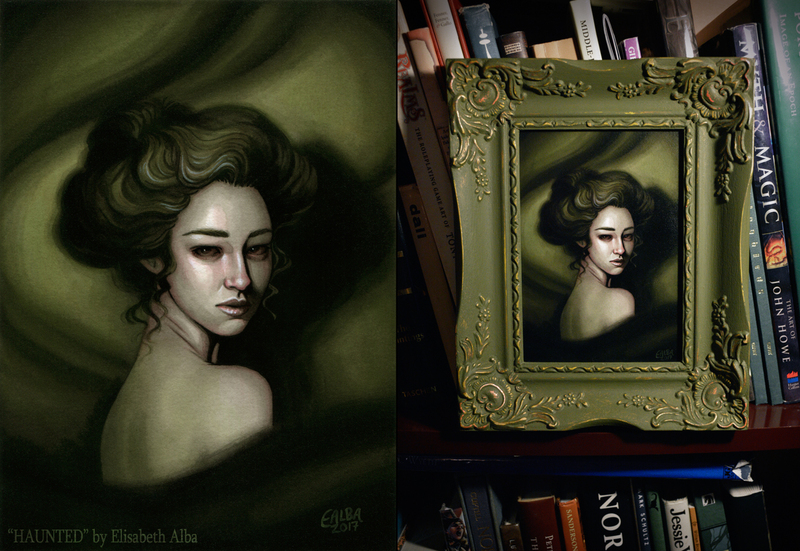 I just created this painting for the Changeling Artist Collective “Haunted” auction – this is a collective of artists (including myself!) and we hold monthly themed auctions of artwork over on Facebook. This painting was created for this cool frame I found in an antique store, and it quickly found a new home. There are some amazing and fun artists in the collective and I am honored to be among them! I have a Twitter account: twitter.com/elisabethalba. As for shops, you can find me at Etsy and Redbubble and I have a list of available paintings for sale at www.albaillustration.com/available.html that I will keep updated. This entry was posted in announcements, artwork, fun happenings, updates and tagged etsy, illustration, links, news, redbubble, shops. Bookmark the permalink.